Trade paperback edition to be released by Picador July, 2017. Terry Tempest Williams' "The Hour Of Land" on Wednesday's Access Utah, TTW interview with Tom Williams, published June 28, 2016. Doug Fabrizio of RadioWest, KUER, NPR of Utah, interviews Terry Tempest Williams on The Hour of Land, June 1, 2016. The Time Has Come, This is "The Hour of Land", A new photography exhibition celebrates the beauty of our glorious national parks, by Miss Rosen, published in Crave Online, July 3, 2016. Read more at http://www.craveonline.com/art/1004771-time-come-hour-land#3lzBKSEIpfIjAMqD.99 Meditations on conservation: An environmental activist urges a renewal of the American national park idea, by Jared Farmer, published in Science Magazine, June 10, 3016. ‘The Hour of Land,’ by Terry Tempest Williams, book review by Andrea Wulf, New York Times, published June 1, 2016. Terry Tempest Williams's Dark Love Letter to the National Parks, the acclaimed nature writer's portraits of 12 parks go beyond perfect postcard tributes, and the resulting book couldn't have come at a better time, by Mary Catherine O'Connor, published on June 3, 2016, in Outside Magazine. The acclaimed nature writer's portraits of 12 parks go beyond perfect postcard tributes, and the resulting book couldn't have come at a better time. Writer and naturalist Terry Tempest Williams joins Doug to discuss her latest book, The Hour of Land. It's a paean to America's natural parks. 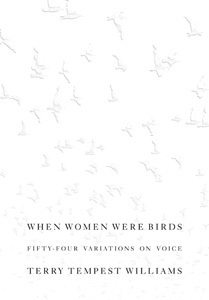 "Williams (When Women Were Birds, 2012), an ardent, often rhapsodic, always scrupulous witness to the living world and advocate for the protection of public lands, celebrates the centennial of the National Park Service in this enrapturing and encompassing chronicle of her deeply inquisitive, meditative, and dramatic sojourns in a dozen national parks. Guided by a finely calibrated moral compass and acute attunement to the spirit of the land . . . this is a uniquely evocative, illuminating, profound, poignant, beautiful, courageous, and clarion book about the true significance of our national parks." 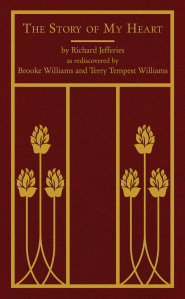 "A broadly ambitious and deeply impassioned collection of essays . . . There are few nonfiction writers who can capture the essence of the American wilderness landscape as eloquently as Williams . 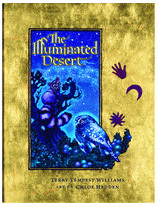 . . her distinctive prose style is capable of conveying a deep spiritual dimension within the physical setting . . . An important, well-informed, and moving read for anyone interested in learning more about America’s national parks." 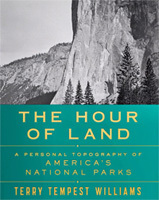 "Taking us through American national parks and monuments, their history, their present reality, the rocks and birds and trees of them, traveling through place, the memory of place, its history, somehow, whether through the spectrum of poetry or personal story, natural history, history, or science, The Hour of Land reveals the very bones and sinew of our land. A redheaded woodpecker, Theodore Roosevelt’s grief, Terry Tempest Williams’s straight-backed father, a horseback ride with her husband through the terrain of the Civil War--slowly, place by place, our country begins to emerge. The South’s Civil War outlook is linked to that of today’s Sagebrush Rebellion here in the West; a planned wall in Big Bend to the inevitable desecration of nature; fratricidal rage to the glorious indifference of the Arctic, righteous rage to the devastation of oil spills, of the earth; Alcatraz to injustice everywhere. The conflagration of Glacier National Park sets the pages on fire, and yet the monument to Cesar Chavez offers the possibility of change: the Hour of Land is at hand. 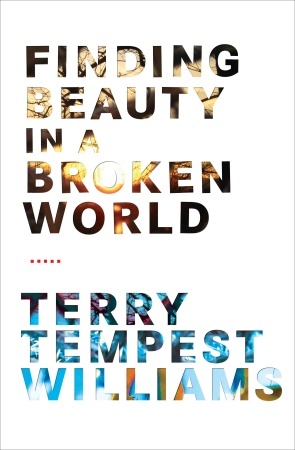 Terry Tempest Williams has literally shown us our country, its physical body, the bones of its history, the urgent reality of our roles in its future. A manifesto that everyone must read and then act upon." © All materials copyright Terry Tempest Williams, 2001-2017, except as otherwise noted.